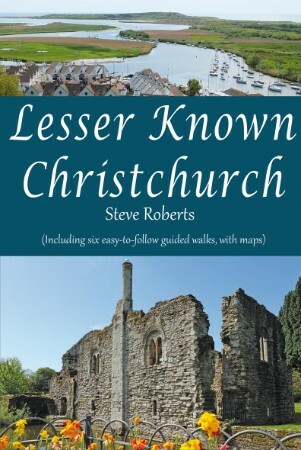 In the autumn of 2013 I began working on my first book, 'Lesser Known Christchurch', which is being published by Dorset books specialist, Roving Press (www.rovingpress.co.uk). The book is the 4th in a series of 'Lesser Known' guides to Dorset coastal towns, the previous books having been on Weymouth, Swanage and Lyme Regis. Lesser Known Christchurch is a modern guidebook to the borough, packed with information and images, full-colour and glossy, with both fascinating history and present day activities fully covered. As the title suggests the book's raison d'etre is to seek out those 'lesser known' stories and anecdotes that make Christchurch special. In compiling the book I conducted interviews with 35 people who have interesting stories to tell of life and work in the town. They come from all walks of life; everyone from a deep sea fisherman and a lifeguard to someone who found fame in the football Premiership, a local authoress and local artist. There are also 6 walks included in the book, which will encourage people to get out and about. These cover different parts of the borough, including Highcliffe, Mudeford, Stanpit and Purewell. The launch event for the book was held in the Lady Chapel, Christchurch Priory, on Thursday August 6th. 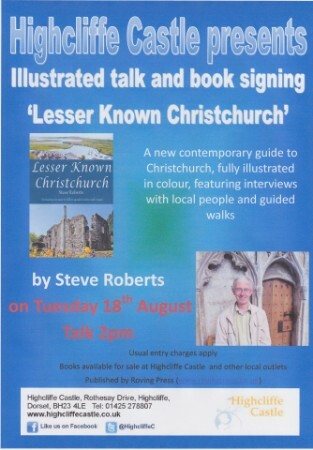 There was also a talk, 'Lesser Known Christchurch', followed by a book-signing at HighCliffe Castle, on Tuesday August 18th.